Bacsinszky d. Bouchard in 3 sets – Don’t make me decide haha! I’ll stick with Timea but i’m starting to think Genie. Ivanovic d. Nara in 2 sets – Ivanovic hasn’t won back-to-back matches since Dubai… but my guess is that this is a good match-up for her. Kasatkina d. Razzano in 3 sets – Hmmm could be dicey for Dasha against the home crowd and a tricky opponent. Suárez Navarro d. Wang in 2 sets – Wang has been in good form but I think CSN wins comfortably on clay. Cornet d. Maria in 3 sets – Since Cornet won her R1 match in super quick time, surely this is a three set epic! Parmentier d. Falconi in 2 sets – Not sure about Falconi healthwise after the fall in Nurnberg. Keys d. Duque-Mariño in 3 sets – Tough match for Madison. Sevastova d. Knapp in 3 sets – A toss-up, really like Sevastova’s game. Bertens d. Giorgi in 3 sets – I think it could go either way, Bertens playing at a high level though with heaps of confidence. Tough to back up the win over Angie though. Svitolina d. Townsend in 3 sets – I’m feeling something for Townsend here, reminds me of Osaka in R2 at the Aus Open. 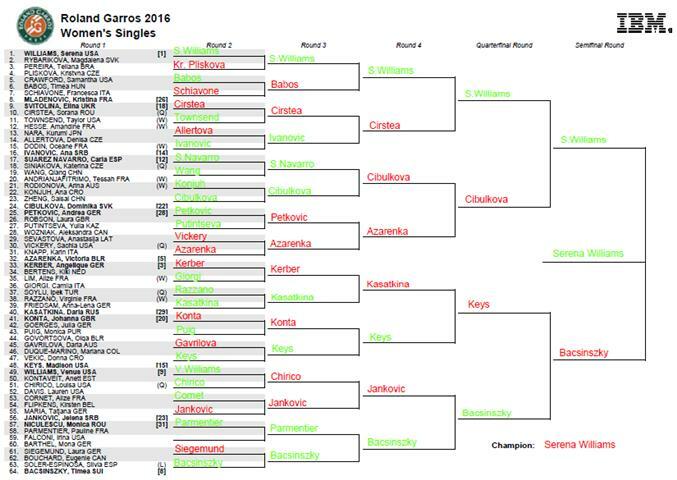 I could see TT winning a set but not being consistent enough to take out Svitolina. Halep d. Diyas in 2 sets – Simona for the win. All of their encounters have been at the Majors. Muguruza d. Georges in 2 sets – Muguruza for the win. Dodged a bullet in not having to play McHale although I think it would have been a different situation to Indian Wells. Kvitova d. Hsieh in 2 sets – A dilemma between two and three sets, Hsieh is tricky! Always going for Petra in this match-up though. Kuznetsova d. Watson in 3 sets – First time match-up, Sveta with a mid-match wobble but too dynamic & powerful for Watson… that’s my guess anyway! Begu d. Vandeweghe in 2 sets – Super impressed how Begu turned her first round match around. Vandeweghe is dangerous but not on clay I don’t think. Zhang d. Stosur in 3 sets – First time match-up and I know they are good friends! Worried about whether Stosur can hit through her backhand with the wrist injury and Zhang will know Stosur’s game because they’ve practised a lot. Therefore gone for a surprise. If it wasn’t for the wrist, i’d go Sam. Beck d. Bondarenko in 3 sets – Tough one, a real toss-up. Bondarenko won their last match in Doha and was superb against Vinci. Just a feeling that if Beck pushes this long enough then she might nick it in a third set. Vesnina d. Rogers in 2 sets – Vesnina has been very consistent these past few months. Strycova d. Hercog in 2 sets – I feel like Hercog has a few crazy H2H records and she leads this one, 3-0. They haven’t played since 2011 and I feel like Bara is a different player these days. She won her first match at RG in foreverrrrr in the first round. Lucic-Baroni d. Osaka in 3 sets – Hipster match of the day, i’d be there if I was in Paris! MLB on clay I think. Larsson d. Pironkova in 3 sets – A toss-up, Larsson more suited to clay but hmmm…. Pavlyuchenkova d. Buyukakcay in 3 sets – I’ve got Cagla in my draw and very tempted to go for her! I think Pavs might just have too much quality though. Makarova d. Wickmayer in 2 sets – Two tight sets. Kerber d. Bertens in 3 sets – This is an interesting one. Bertens is obviously in great form after winning Nurnberg although she only beat one top 50 player, an out-of-sorts, Vinci. It depends on Berten’s recovery and Kerber’s fight. I think we’ll know pretty early if Kerber’s up for the battle. Inclined to stick with Kerber but I always go the wrong way with these matches haha! S.Williams d. Rybarikova in 2 sets – Serena for the win. Schiavone d. Mladenovic in 3 sets – This could be a really entertaining match and hopeful of a thrilling three setter. At RG, always have to fancy Fran. Ivanovic d. Dodin in 3 sets – Very interesting match… Dodin capable to cause a few shockwaves but doubt she’ll have the consistency to defeat Ivanovic. V.Williams d. Kontaveit in 2 sets – Venus won their only previous match at the US Open and I remember it vividly where Kontaveit didn’t have the patience or the variety to really trouble Venus. The Estonian player also hasn’t played since Miami. Azarenka d. Knapp in 2 sets – Interesting to see how Vika looks early on. Cornet d. Flipkens in 3 sets – This could be a delight… neither has been in particularly good form but i’d fancy Cornet to rediscover some form in front of her home crowd. Petkovic d. Robson in 3 sets – Really looking forward to this match, think that Robson won’t be consistent enough despite Petko’s poor recent form. Razzano d. Soylu in 3 sets – Interesting match, going for Razzano with home support. Parmentier d. Niculescu in 2 sets – Going for the upset, Niculescu hasn’t won since missing match points against Kvitova in Stuttgart. Parmentier played well to reach the quarter-finals of Strasbourg and had a good run in Paris a few years back. Jankovic d. Maria in 2 sets – JJ showed improvement between Rome and Madrid following some time away, and I think she’ll keep improving to get the win here. Cirstea d. Svitolina in 3 sets – Being bold, really like Cirstea in this match-up. Preview HERE. Bacsinszky d. Soler-Espinosa in 2 sets – Good match-up for Timea, never struggled before in this match-up. Suárez Navarro d. Siniakova in 3 sets – Seen a few flutters that this could be a potential upset alert… gone for three sets but I see CSN advancing. Keys d. Vekic in 2 sets – I had a dream last night that Keys lost her first round match but it wasn’t against Vekic (can’t remember who now!). Easily could go three sets but will be surprised if Keys goes out. Cibulkova d. S.Zheng in 3 sets – Expecting a battle, but Domi gets the win. Puig d. Govortsova in 2 sets – Puig pulled up in tears with an injury in Strasbourg yet Govortsova has lost her last eight matches. I think Puig should be OK but just a guess! Chirico d. Davis in 3 sets – Could be a tough one but fancy Chirico to overturn a loss in qualifying to Davis earlier this year. Putintseva d. Wozniak in 2 sets – Poots makes a meal of these types of matches… Wozniak hasn’t played since April. I’ll go for Poots in 2! Allertova d. Nara in 3 sets – Allertova has been injured lately. I’ve gone for a win but this may be foolish. In heavy conditions, Nara probably the more likely choice. Falconi-Barthel – Literally no idea, Barthel hasn’t played since AO while Falconi injured herself in Nurnberg… neither?! Thrilled to see Mona back. Giorgi d. Lim in 2 sets – Giorgi I suppose? Konta d. Goerges in 3 sets – Really tough one, could be one of the matches of the day. Makarova d. Lepchenko in 2 sets – Tough match for Makarova on clay but still fancy her to get the job done in two very tight sets. Kasatkina d. Friedsam in 3 sets – Daria just but i’m wary of this one, wouldn’t be surprised if it was an upset. Vickery d. Sevastova in 3 sets – Hmm not sure, Vickery did well in qualifying. Siegemund d. Bouchard in 3 sets – Cannot believe this is out on ct. 16 but so many good matches! Preview HERE. Townsend d. Hesse in 3 sets – I think this could be an entertaining match. Three sets for sure, I do like TT and she’s been winning a lot of matches lately. Wang d. Andrianjafitrimo in 2 sets – I haven’t learnt how to spell… Tessah’s name! Wang’s been in good form on the ITF circuit but not on clay! Stosur d. Doi in 2 sets – Depends on the wrist injury which is apparently affecting the backhand… if fit and healthy then Sam for the win. Otherwise it could be dicey as Doi’s more than decent. Gavrilova d. Duque-Mariño in 2 sets – Tough turnaround from Nurnberg for MDM. Konjuh d Rodionova in 3 sets – Konjuh for the win? Zhang d. Voskoboeva in 3 sets – Hmmm a little on the fence, just Zhang? Kr. Pliskova d. Pereira in 3 sets – Pereira is the better player on clay but she’s had a rough year. Radwanska d. Jovanovski in 2 sets – If this wasn’t Jovanovski’s first match since February then she could probably cause some bother for Radwanska. However, I think Aga should roll through in two sets. Muguruza d. Schmiedlova in 2 sets – All the stats point towards Muguruza… a 4-0 H2H lead including a recent win in Madrid and most notably, Schmiedlova has lost her last 11 matches on the WTA tour and all in straight sets. Kuznetsova d. Shvedova in 3 sets – This match-up makes me nervous for Kuznetsova. I think it will go down to the wire but i’m giving Sveta the edge with her record in Paris. Garcia d. Tsurenko in 2 sets – CarGar always makes me nervous but she’s coming off the back of a buoyant title run in Strasbourg. Should be two sets, but wary it could go the distance! Halep d. Hibino in 2 sets – I don’t anticipate too many problems for Halep in this match, it *should* be straightforward. Gibbs d. Watson in 3 sets – A toss-up and i’ve changed my mind several times today. Gibbs’s results on clay have been disappointing when stacked up to her form on hard courts earlier in the year… but for some reason (can’t quite put my finger on why) i’m going for Gibbs. Vinci d. Bondarenko in 3 sets – Upset alert for sure, fancy Vinci to pull through as Bondarenko’s form hasn’t been as convincing in the last month. Beck d. Zanevska in 3 sets – Beck should win this one comfortably… imagine it could turn out to be a struggle though. Vandeweghe d. Broady in 2 sets – This match-up on clay makes me laugh… CoCo is winless since Miami while Broady’s won a couple of matches on clay. Vesnina d. Brengle in 3 sets – Brengle can be a handful but Vesnina has won a lot of matches this year so should be confident. Begu d. Mattek-Sands in 2 sets – Big chance for Begu with this draw, has a 4-0 H2H record over BMS so would be surprised if she doesn’t win this. Ka. Pliskova d. Rogers in 2 sets – Generally not fancying Pliskova this tournament but this should be a solid match-up for her. Ostapenko d. Osaka in 3 sets – If I was in Paris i’d heading over to this match! Not sure about Osaka on clay. Lucic-Baroni d. Hantuchova in 3 sets – Can’t believe these two have never played. MLB was great in Strasbourg but can blow hot and cold. Liked Hantuchova’s comments about just enjoying her tennis and not really playing for ranking etc. Errani d. Pironkova in 2 sets – Going for Sara’s first win on red clay. Always dangerous at RG despite recent form. Stephens d. Gasparyan in 3 sets – An exciting match-up but neither has been in good form so likely a mess! Both need the win big… Gasparyan hasn’t won on clay this year while Stephens has had a pair of poor losses to Tig and Parmentier in her last two tournaments. Never know with Sloane, but I think she wins this one. Lisicki d. Cepede Royg in 2 sets – Hmm who knows?! Going for Sabine, not a great deal of confidence. Strycova d. Hradecka in 2 sets – I think Hradecka was struggling with an injury after her epic third round qualifying win. 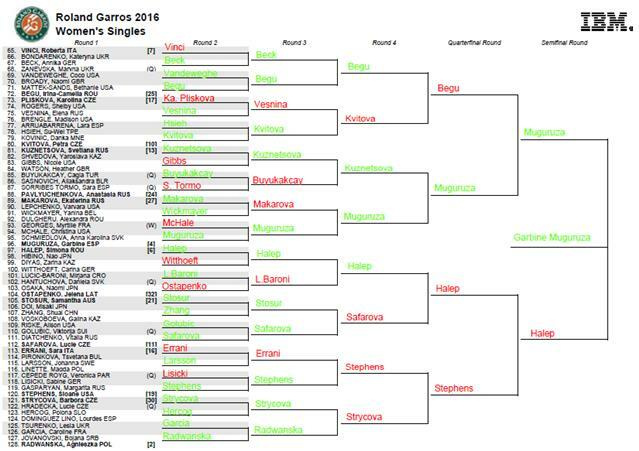 Liking Strycova in this draw and conditions. McHale d. Georges in 2 sets – A good draw for McHale, imagine it won’t be entirely straightforward. Buyukakcay d. Sasnovich in 2 sets – A great draw for Cagla if she can stay focussed. Wickmayer d. Dulgheru in 2 sets – Not sure about Dulgheru’s health, has been struggling with a knee injury. Wicky leads the H2H, 4-0. Larsson d. Linette in 2 sets – Going for Larsson on the clay. Hercog d. Dominguez Lino in 3 sets – Eeek about this first rounder compared to some of the others. Witthoeft d. Diyas in 2 sets – Surprisingly decisive with this one, fancy Witthoeft to prevail. Kvitova d. Kovinic in 3 sets – I very nearly went for Kovinic in this match but something’s telling me Kvitova will survive. Kovinic is decent on the clay but she can blow hot and cold quite spectacularly from recent matches i’ve watched. Sorribes Tormo d. Pavlyuchenkova in 3 sets – Big fan of Pavs’s game but we’ve been here before… SST is competent on the clay and just a feeling she might bag a win here as the conditions are likely to be heavy. Golubic d. Riske in 3 sets – Riske has done OK on the clay this year but favouring the qualifier. Hsieh d. Arruabarrena in 2 sets – Arruabarrena hasn’t done much since being part of one of the best matches of the year against Kerber in Charleston. Leaning towards Hsieh who has picked up some solid wins on the clay this year. *Note – a few changes since I posted my preview article… i’m indecisive, what I can say. I’m so close to going for Muguruza as my champion. It’s 50/50 in my head between Serena and Garbi.